Welcome to Bella… with over 40 years build experience we are proud to offer this affordable living located on a 450 m2 block in the Eden’s crossing estate at Redbank Plains. You will love this location for all the conveniences it has to offer. 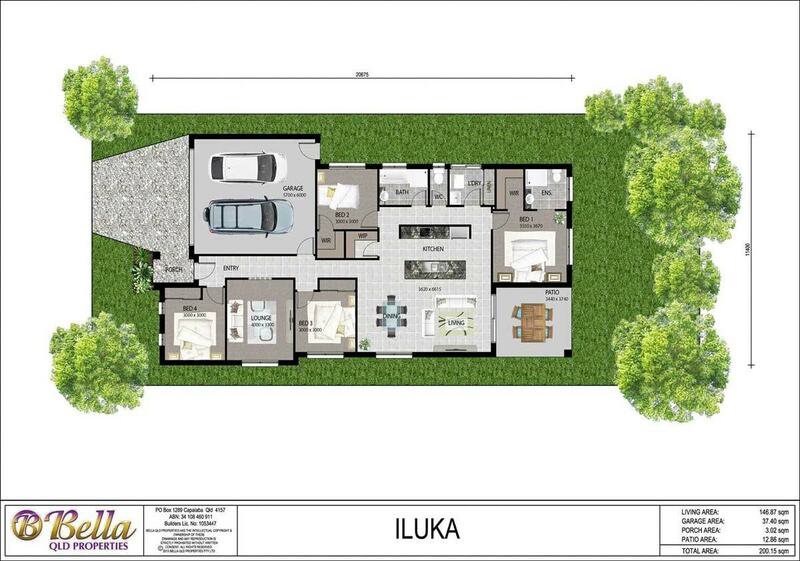 Our spacious ILUKA home offers easy care living with stylish mod-cons. There are 4 bedrooms with the master to the rear, including Ensuite & Walk in robe, open plan kitchen/dining/living and outdoor underroof patio ideal for Queensland’s summer evenings. The gourmet kitchen features Roman Stone bench tops with Stainless Steel appliances. This home has all you need with Bella’s high end PRESTIGE Inclusions (worth $47,000) and quality finishes that stand out. Deal directly with the builder and experience our personalized friendly customer service – what more could you ask for, you won’t be disappointed. Situated in a fast growing area with affordable land prices SO YOU MUST BE QUICK! •	Quality fixtures and fittings, plus many more outstanding features. •	$15,000 1st Home Owners Grant may be enough to make this home a reality! Bella QLD Properties Ltd is a boutique master builder and our homes are constructed to the highest standard. Being a family owned company we actually care about you and your investment. Eden’s crossing is one of the fastest growing communities nestled in between the well developed Springfield and fast developing suburb of Ripley. With nearby shopping centres, schools, colleges, university, train, easy access to centenary hwy make this location perfect to build your family home. With fresh and exciting home choices, including land for sale and house and land packages to suit every lifestyle and budget, this is the perfect place to build your dream home in the countryside that’s connected to everything you need. Contact Glen Whitla on Mobile: 0438 009 631 or Email: glen@bellaqldproperties.com.au to secure this offer or discuss an alternative house and land package.